6701 E Azure Hills Drive, Cave Creek, AZ.| MLS# 5909186 | Desert Dream Realty Cave Creek | 480-252-8300 | Find Your Dream Home with Us! This charming 3 Bedroom 2.5 Bath Cowboy Chic Custom home with welcoming courtyard is located on an elevated yet private lot with Majestic Mountain views. Just a short drive to shopping and dining, on paved roads with City Water. Enjoy stargazing from the wrap-around patio areas while entertaining or just relaxing in your Sonoran Desert surroundings. 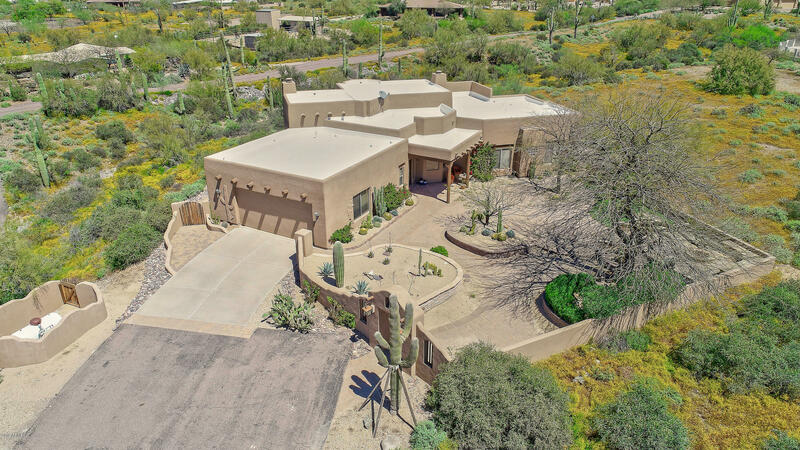 Beautiful natural landscape with numerous Saguaros surround this very well maintained, immaculate, move-in-ready home. All one level with an open floor plan high ceilings and a large spotless epoxy floored garage. Horses are welcome and trails are plentiful in the area. Plenty of room for your RV too. Tastefully remodeled baths, kitchen, updated A/C and Roof re-coated in 2019! Most furnishings are available for purchase by separate agreement.